Are Aerosmith Nevada Residents Now? Saturday night Aerosmith kicked off their Dueces Are Wild Las Vegas Las Vegas residency with a packed house at the Park Theater the Park MGM. A half hour documentary about the band, followed by a 16 song set list of Aerosmith hits. 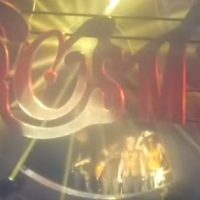 For Aerosmith, the venue brought in a unique sound system, boasting 230 speakers, 4 times more than the average show would have. Aerosmith will play 34 more “Dueces Are Wild” dates in Las Vegas this year, making them unofficial Nevada residents, as far as we’re concerned.